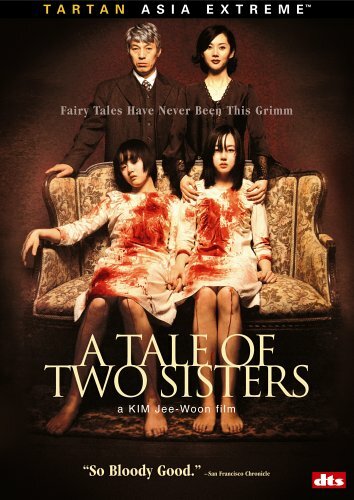 Back in January i wrote about A Tale of Two Sisters, and wanted to mention the DVD release in single and double disc versions. i've viewed the gorgeous double disc set, though not every feature. Not many people had a chance to see this amazing psychological horror picture in the theater, but now there's no excuse for missing out. There are two director commentary tracks, one with the cinematographer and lighting director, and one with the marvelous actresses who play Su-mi and Su-yeon. The commentaries are worthwhile, the latter one amusing as the young actresses defer so much to the director that it's sometimes difficult for Kim Jee-Woon to coax comments from them. Watching one of the commentaries, which are subtitled with the voice track in Korean, i tranced out and forgot the subtitles weren't for the movie itself! But, with multiple documentaries, interviews, analysis by the director and a psychiatrist, Tartan Asia Extreme has produced a very rich package for US viewers. Amazon and other sellers are offering the double set for nearly the same price as the single. This is a film requiring multiple viewings, not unlike The Sixth Sense, and it's so beautiful that i'm delighted i can watch it again and again. About 20 years ago a friend expressed surprise i didn't know Nightmare Alley, and not long after it ran on cable a few times. It was a revelation, as though it was made just for me, and it completely altered my opinion of Tyrone Power. Unfortunately for the actor, it altered lots of fans' opinions of him, but not in a good way. Today, it blows away many who see it for the first time. William Lindsay Gresham published his first novel, Nightmare Alley in 1946, based on his experiences hanging about on the fringes of the seedy carnival underworld. He later wrote an excellent nonfiction carny book, Monster Midway. In the film Shadowlands, the Joy Davidman (Gresham) character (played in Richard Attenborough's romanticized docudrama by Debra Winger), was previously married to Gresham, a story that has as many ironies as any of Gresham's books. There is also a very well executed graphic novel of Nightmare Alley by Spain Rodriguez. But Edmund Goulding's 1947 film noir is hands down Tyrone Power's best picture, and the form Gresham's book will probably be best remembered. Power had fought to do The Razor's Edge with Goulding the previous year, as his return to the screen after military service, and in many ways Nightmare Alley is a more successful and honest approach to a similar theme. The cinematography, by Lee Garmes, is perfection, Ty is brilliant, and the rest of the cast, particularly Coleen Gray and Joan Blondell, act as though they knew they were in something special. The Fox Film Noir DVD release of this film looks much better than on cable and has a commentary track by James Ursini and Alain Silver that's kind of loopy. When i'm as mad about a film as i am about this one, however, i'll even enjoy the comments of two film historians who don't have that much to say and are redundant when they say it! Entertaining, melancholy, and downright creepy, Nightmare Alley is an unique experience. Like Stanton Carlisle, you'll find out how geeks are made. I so enjoyed reading about Nightmare Alley, a favorite film of mine going back many years. I am curious as to your comment about Tyrone Power's performance, and I quote, "Unfortunately for the actor, it altered lots of fans' opinions of him, but not in a good way." I'm unclear about this. He received wonderful reviews, and very few fans saw the movie - Fox simply indulged him by letting him do it, but they released it as a B picture, never publicized it, and withdrew it immediately from the theaters. It is true that his fans preferred him in the costume dramas, but once he left Fox, he broke out of them and had huge successes with The Eddy Duchin Story, The Long Gray Line, Mississippi Gambler, and Witness for the Prosecution.